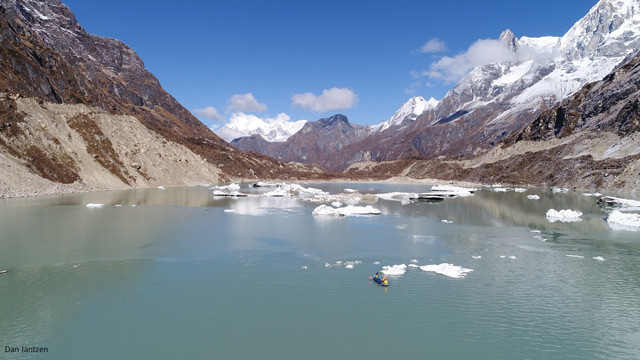 HIMALAYAN MELTDOWN: A raft with scientists monitoring the expansion of Thulagi Glacial Lake in Central Nepal are dwarfed by the surrounding mountains and the water body that has expanded alarmingly in the past two decades due to global warming. Mountain environment is rapidly changing. Climate change is leading to warmer temperatures and changing precipitation patterns, directly impacting Himalayan glaciers. Nepal is home to some of the highest glaciers in the world, yet many will diminish to shadows of their former selves in the coming centuries. Glaciers are retreating to pockets of sun-hidden refuge, where lower air temperatures prolong their existence in the shade of the high mountains. The scenery attracts visitors from all over the world, but tourists are transient. 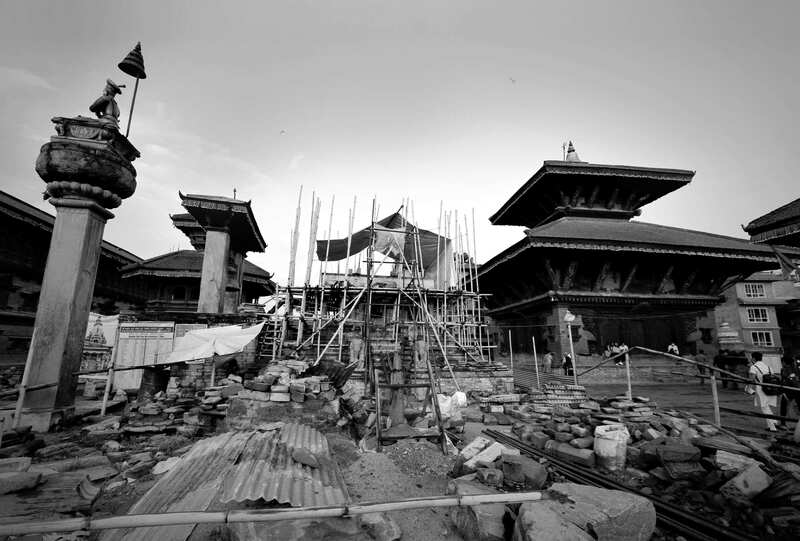 It is the Nepalis who call this landscape of extremes their home. While scientific research tries to understand how glaciers will rapidly disappear, working with those affected to mutually share observations and adaptation strategies is now critical. Glaciers are vast reservoirs of water, pathways to the highest peaks on earth and home to communities of living things. When experiencing their beauty, we should also consider their demise and be proactive towards global strategies to slow the rate of change and engage with sustainable adaptation strategies. Glaciers are intrinsically linked to and indeed shape the mountain environment. 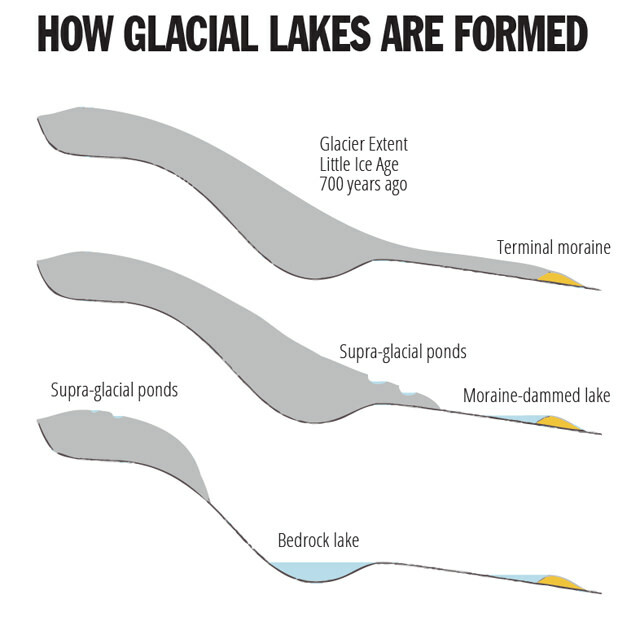 In turn, sediment and rock transported onto the surface of debris-covered glaciers shapes their evolution. This insulating layer of rocks and sediment can grow several metres and obscures the moving ice beneath. Yet, the glaciers are shrinking rapidly. Supraglacial ponds on Khumbu Glacier with Mt Pumori and Mt Nuptse in the background. The ponds absorb the sun’s heat and cause the ice cliffs to melt faster, making the ponds grow faster. Khumbu Glacier is thinned by an average of ~1 m per year (1984‒2015) where the insulating debris isthinnest close to Everest Base Camp. The spatial distribution of thinning leads to a flatter glacier profile, although local relief can still exceed tens of metres. A flatter glacier is more prone to water ponding on the surface, which can eventually form large glacial lakes. 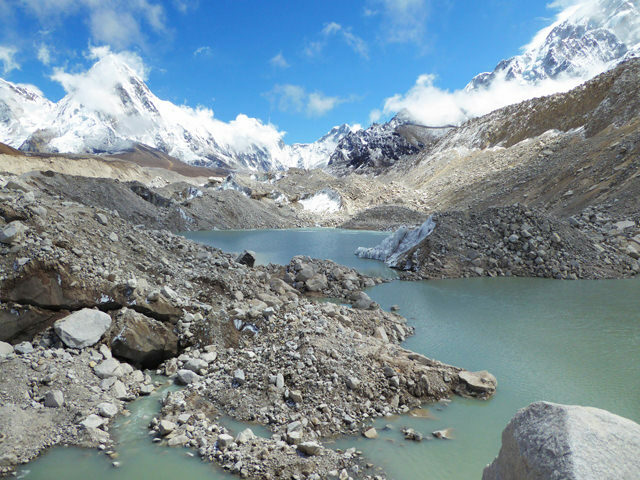 At Everest Base Camp, the Khumbu Glacier is flowing down-valley at over 30 m per year. Yet there is virtually no movement 7 km further down the glacier adjacent to the village of Lobuche. Exposed ice cliffs and supraglacial ponds on the glacier surface are hot-spots of melt. The ponds absorb and transmit thermal energy into the glacier interior, such that the process can become a positive feedback loop, leading to an expanding network of ponds. With a pond at their base, ice cliffs rapidly retreat across the glacier, generating melt water and leaving a trail of fallen debris. Stagnating glaciers provide new habitat for birds, bees, small mammals, macro invertebrates (small critters living in ponds), and occasionally grazing livestock. Vegetation grows when the glacier slows and the surface stabilises. Because the wall of sediment and rocks blocking the lake are of unknown stability, downstream communities can be threatened and require close field monitoring and analysis of satellite imagery. The hydropower potential of these lakes could one day be tapped, however, some lakes will inevitably breach their dams and cause downstream flooding, often triggered by large avalanches. Access to water resources will change as snow cover reduces and glaciers disappear, also requiring community adaptation Therefore, awareness, early warning, and adaptation is key. 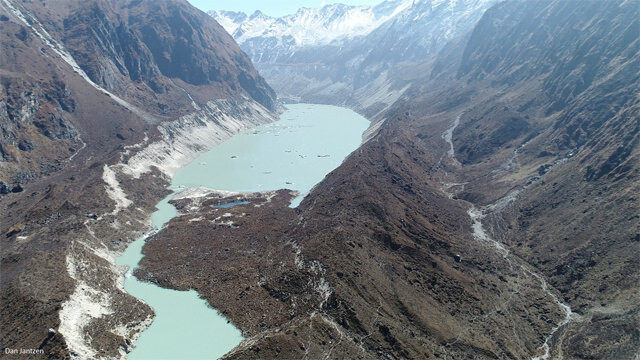 An aerial view of Thulagi Glacial Lake shows the fragile moraine that blocks the water. 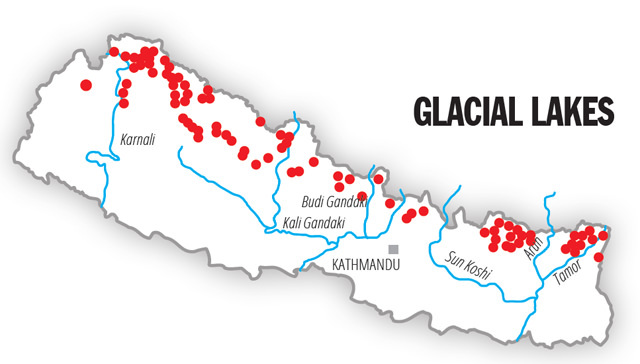 Collapse of these moraine dams threaten communities downstream. 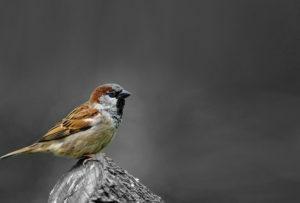 There is often a disconnect between scientists, mountain communities, transient mountain visitors, and government and non-government agencies. Scientists should be open about observed and predicted changes, but also the associated uncertainties. Open Access publishing allows scientific research to be read by all. 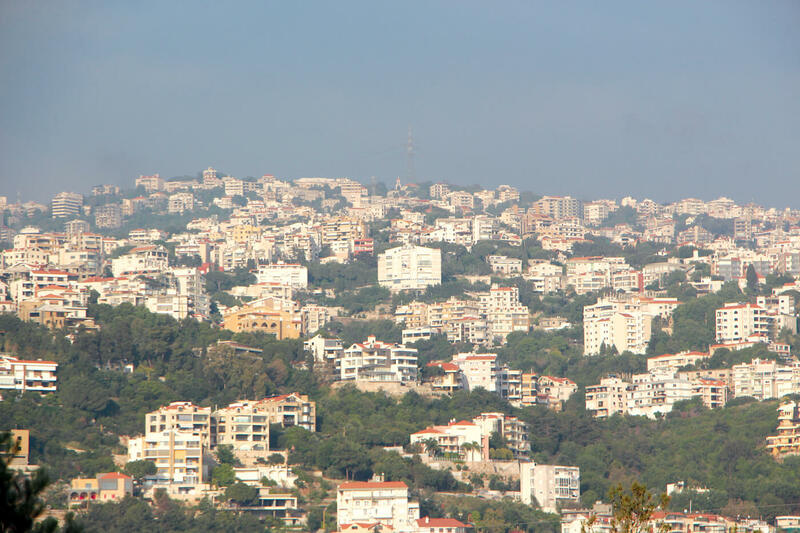 Communities can retain vast historical knowledge of previous environmental stresses, and are well placed to describe ongoing changes and their adaptation requirements. Engagement is therefore key for research to be targeted efficiently and used to guide adaptation strategies. Anyone can volunteer and become a citizen scientist: communities, mountaineers and tourists can all contribute to targeted data collection and analysis. Communities are well placed for continual observations targeted to local needs, such as stream and river flows, timing of the growing seasons, and documentation of flood events. Local and international mountaineers access the highest peaks on earth and can bring back snow and rock samples, maintain weather stations, capture repeat photography and provide specialist knowledge of changes in the high-mountain environment. Tourists can also capture repeat photography, and may also have the opportunity to capture aerial imagery from helicopter flights, which can be used to reconstruct the environment in 3D. There are opportunities for everyone to engage with research that is ultimately geared towards improving our understanding of global change and how best to adapt. C Scott Watson is an environmental research scientist and runs the outreach website RockyGlaciers.co.uk.